Among Burmese, the year 1988 holds special significance. The nation had been under the heel of an oppressive military dictatorship since 1962, and in those 26 years had endured brutal civil wars, a crumbling economy, violent ethnic conflict, and horrific political oppression under General Ne Win. But in 1988, General Ne Win drastically devalued the currency of the already impoverished country, stating that any monies divisible by the number nine were invalid. The reason for this bizarre and arbitrary decision — he was following the advice of an astrologer. All over the country, huge numbers of protestors took to the streets in what became known as the 8888 Uprising. Many people were killed or arrested by government forces during the demonstrations. Myo Myint Cho now lives in Fort Wayne with his younger sister (also arrested in 1988, though not convicted) and her husband (another former political prisoner jailed for 11 years) where he continues to work for freedom and democracy in Burma. He’s the subject of Burma Soldier, a new HBO documentary by award-winning filmmakers Annie Sundberg and Ricki Stern (The Trials of Darryl Hunt; The Devil Came On Horseback) and Nic Dunlop, that debuts on HBO May 18. 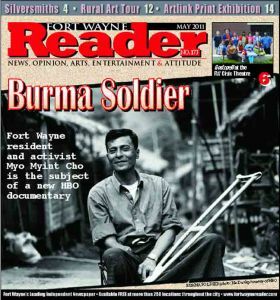 On May 17, the day before its debut on HBO2, there will be a screening of Burma Soldier at the Allen County Public Library Theater, followed by a discussion. My Myint Cho and filmmaker Annie Sundberg will participate in the discussion afterwards. Myo Myint Cho was well aware of the evils of Burma’s military dictatorship long before he was imprisoned — he had personally born witness to them as a young soldier in the Burmese army. Myo Myint Cho lost an arm, a leg, and several fingers in a mortar attack when he was 24. Already shaken by what he had seen as a soldier, Myo Myint Cho’s beliefs started changing further while he was recovering and undergoing treatment in the hospital. He began reading some of the books that had been banned by the government. Myo Myint Cho eventually left the army, but only a few years later he was arrested during the 1988 crackdown and sent to prison for 15 years. When he got out, at age 41, he was constantly watched by the government. He made the decision to flee to Thailand, where he hoped to reestablish communication with family members. Myo Myint Cho eventually made it to the US and joined his sister and brother-in-law in Fort Wayne. He continues his political activism, and maintains as much contact as possible with friends still in Burma. He says he often uses Facebook to exchange news with friends there — the government maintains a firm grip on internet access, but Myo Myint Cho says that, for whatever reason, they allow Facebook. It many ways, the struggles in Burma seem to have all the elements to make it a focal point of US concern — citizens living under an oppressive and brutal military dictatorship fighting for democracy, human rights, and freedom. The US government has refused to engage the military government there until just recently, and along with other nations has imposed very strict economic sanctions on the country. Yet Burma doesn’t seem to get as much attention from the US media as some other “hot spots” around the world where similar conflicts are happening. Anyone with a fleeting awareness of current events can tell you a little about what happened in Egypt or Tunisia over the past several months, but knowledge about Burma remains vague. Myo Myint Cho theorizes that one possible reason for this lack of knowledge is a sort of “media bias” that he believes is a hold over from the Cold War years. Many Americans, he points out, know far more about political oppression in places like China, Cuba, and even North Korea because these are communist countries. That’s how the US often sees political oppression, as part of communism. The military regime in Burma was (and still is) fervently anti-communist, Myo Myint Cho says. Considering Burma’s proximity to China and Vietnam, the US may simply have preferred to look the other way when the military coup happened in 1962 in the midst of the Cold War, perhaps hoping for a future ally in the war against communism. But Myo Myint Cho sees that changing. He says the US government is talking much more about Burma these days, which in turn focuses more media attention on the conditions there. 29 people	reviwed this story with an average rating of 4.4.